April 21st, 2013 marks the final day of the Cherry Blossom Festival with a great display of art and community that is The Grand Parade. Featuring a number of honored performers from Japan, streams of colorful floats, world-renowned San Francisco Taiko Dojo’s thundering drums, traditionally costumed dancers, musicians, and the Taru Mikoshi (Shinto shrine), this celebration of Japanese heritage and tradition will flow like colorful butterflies from the Civic Center, proceeding up Polk to Post Street, and ending in Japantown at Post and Filmore Streets. For two weekends leading up to the pageantry of the Grand Parade, the Northern California Cherry Blossom Festival features food booths, cultural performances, live bands, the annual Queen Program and more. Saturday and Sunday, April 13th and 14th, and the following Saturday and Sunday, April 20th and 21st, all are welcome to participate with some 300,000 other visitors in the 46th annual festivities. Said to be the second largest Cherry Blossom festival outside of Washington, D.C., this celebration is free to the public and an excellent opportunity to support and participate in Northern California’s Japanese American culture. 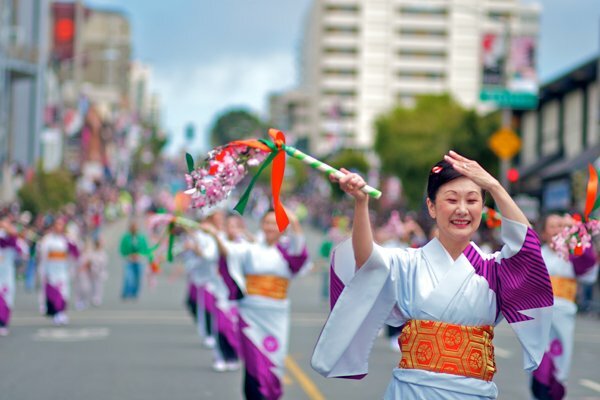 The Grand Parade commences at 1:00 PM PST, Sunday, April 21st, 2013 at City Hall and concludes in Japantown at about 3:00 PM. For more information, go to www.sfcherryblossom.org. Questions about the grand parade can be submitted to CBFParade@gmail.com.